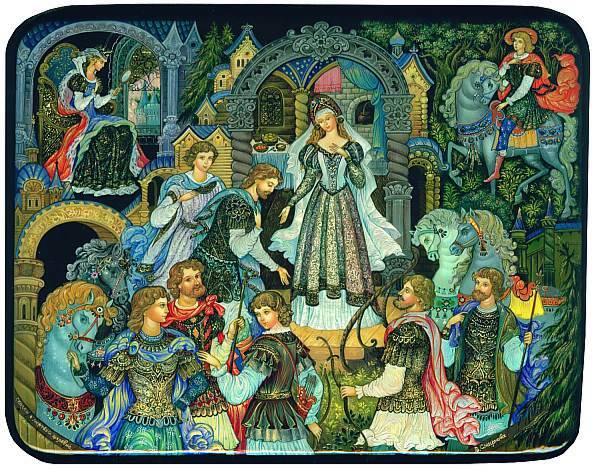 All the main characters from Russian fairy tale "Tale of Dead Princess" are shown here, including Prince Elisej (top right), the princess in the center, the evil Queen (top left) and all seven gallant bogatyrs. 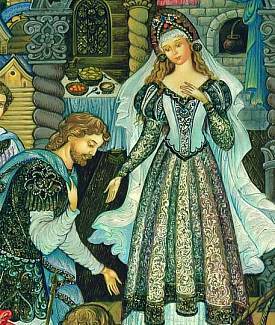 You will marvel at the details in this one, including the beautiful intricacies of what each character is wearing. Each article of clothing seems to look more beautiful than the next, and one can only imagine what it will look like when the fine gold leaf details are seen in person. A gorgeous box.